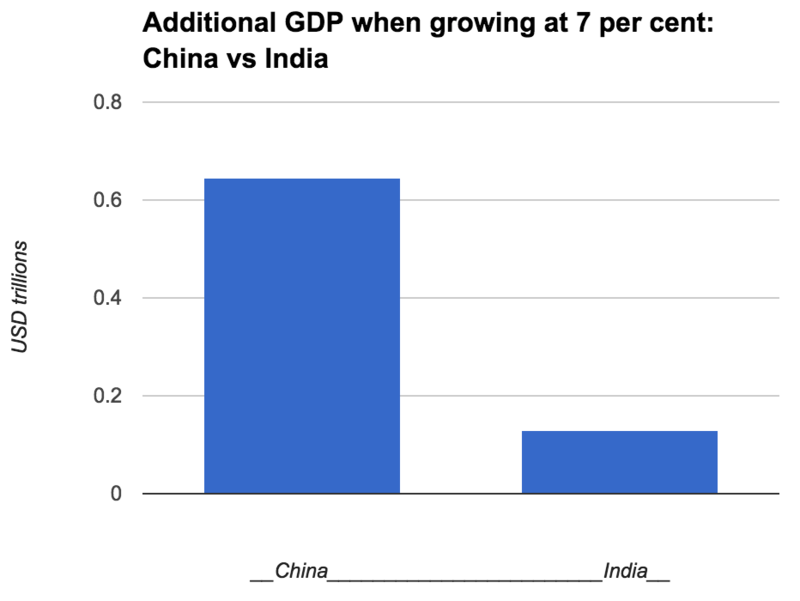 Will India save us from the decline of China? This chart in the RBA’s chart pack today made me smile. The Indian economy has been able to accelerate its growth rate over the last three years to the point where it is now above Chinese growth. This is a good result for Manmohan Singh and his successor Narendra Modhi. It will transform the lives of millions of Indians. They’ll gain opportunity they never before had. But I want to look at this from Australia’s perspective. Chinese growth has been essential to our economic health. The extra economic activity it added each year forced the Australian economy to expand too. But now its growth is shrinking. Will we see Indian growth take up the slack? Here’s how much extra GDP the two giants add when they both grow at seven percent. They don’t compare. China is far more valuable. The reason is a bigger economy. China has more people and they are far richer. All those years of ten percent growth mean China’s economy is now worth over $9 trillion US dollars a year. India’s economy is worth less than $2 trillion a year. So we ought to be cautious about anybody hyping the new economic miracle of India. 1. India will soon be the new China. 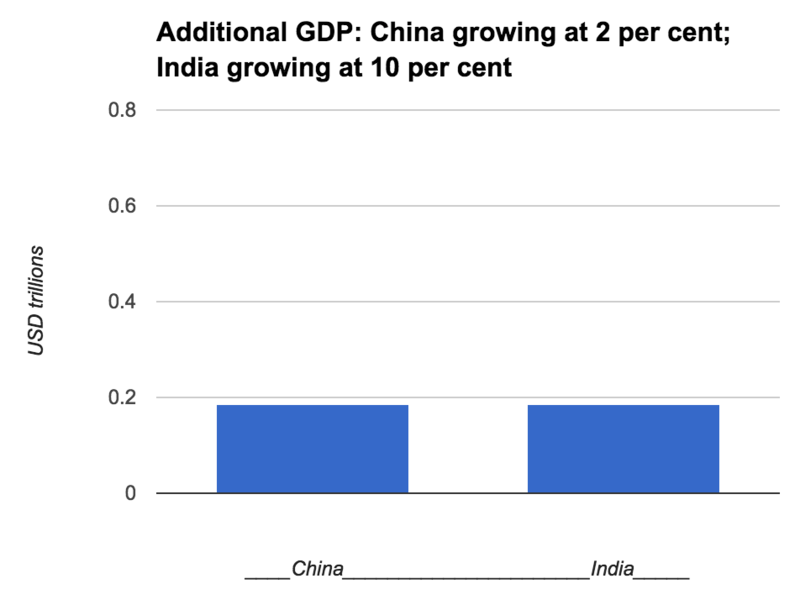 The two economies’ contribution to global growth, and their capacity to boost Australia, would equal out only if China’s growth slumped to two percent, and India’s rose to ten percent. 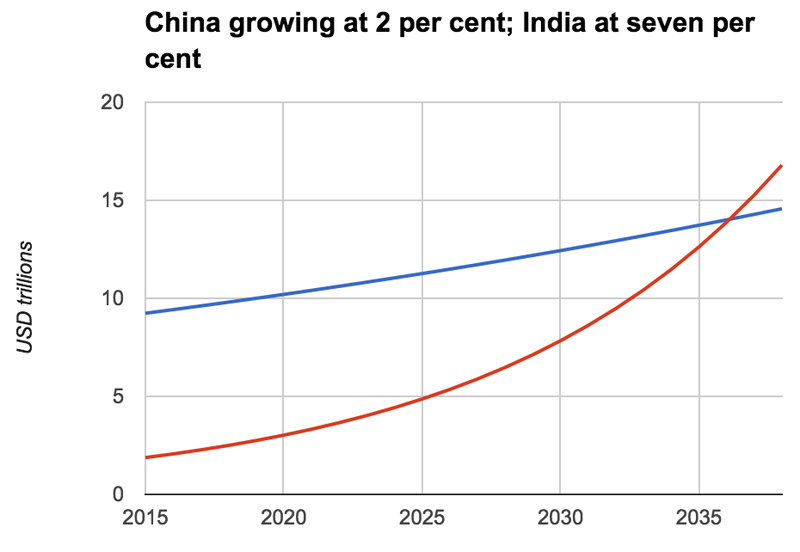 Even if this amazing scenario happened, with China stuck in the doldrums and India roaring ahead, it would still take two decades for India to become a bigger economy than China. We should cheer Indian economic growth, of course. It is not a country where poverty is relative and middle-class concerns about the prioritisation of material lifestyles apply. Indian growth will eliminate misery. But it will not single-handedly save Australia. 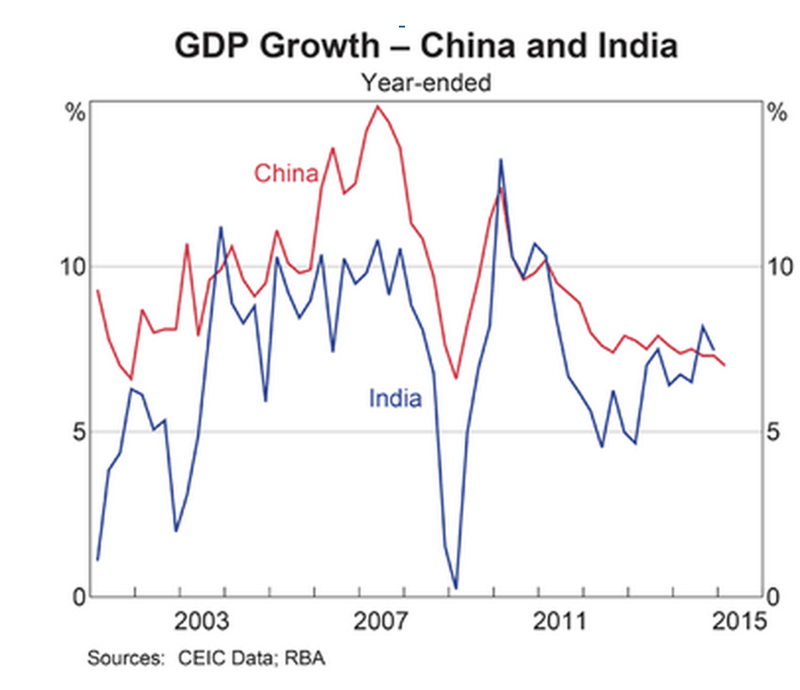 Relying on India for the sort of lift China gave us over the past decade is a recipe for disappointment. Next Next post: Thoughts on how to invest right now.